TOYOTA has announced plans to make a baby. A baby SUV to sit below its popular RAV4 – to be revealed as a production model at the Geneva Motor Show early next year. 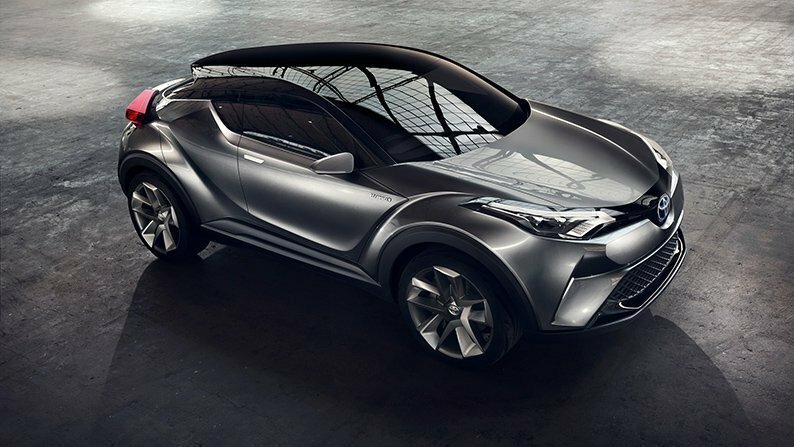 But for now, the Japanese car maker has used the world reveal of a second C-HR Concept vehicle to confirm production plans for an all-new stylish, lightweight and dynamic SUV. The latest C-HR design study, unveiled at the Frankfurt Motor Show, features bold design language that projects a confident and sporty look while new platform architecture promises an engaging drive experience. The new five-door show car builds on the success of the first C-HR Concept that was enthusiastically received when it debuted at the Paris Motor Show 12 months ago. Toyota says the version shown at Frankfurt is more closely representative of the production car that will be revealed at the Geneva Motor Show early next year. Its more refined execution is designed to gauge reactions from specific target customer groups so that their feedback can further inform the project designers and engineers. It is the next rendition of the promise by Toyota’s global president Akio Toyoda to build always better cars that bring the fun back to driving. Toyota Australia’s executive director sales and marketing Tony Cramb said the second C-HR Concept heralds an exciting possible addition to the company’s local line-up. “The stunning looks, compact packaging and outstanding agility inherent in the C-HR Concept mean the production car is definitely on our wish-list for Australia,” Mr Cramb said. “Given the right specification, pricing and availability for our market, we would expect the C-HR production model to accelerate the already-hot demand for vehicles in the small SUV segment,” he said. The innovative second C-HR Concept has been designed around a new platform, developed under the TNGA (Toyota New Global Architecture) program. TNGA manifests itself in the new C-HR Concept through a highly rigid body and a low centre of gravity that minimise body movement and vehicle roll during cornering. This allows for suspension settings that deliver ride comfort without detriment to driving dynamics, equipping the C-HR Concept with responsive handling, agility and straight-line stability. The second C-HR Concept is the result of co-operation between Toyota’s ED2 (European Design Development Centre) and the company’s other design centres. It continues Toyota’s exploration of an expressive new, diamond architecture styling theme that was first seen with last year’s Paris concept car. The lower bodywork has been sculpted to represent the faceted surfaces of a highly-durable, precision-cut gemstone. An exceptionally sleek cabin contrasts with aggressively angular rear shoulders and muscular wheel arches that feature unique 21-inch wheels with “diamond-cut” machined-surface spokes. Piano black paint conveys the impression of a “floating” roof that is detailed with patterned openings to create an animated play of light within the C-HR Concept’s cabin space.